The Crunch 250 HDD crusher is a powerful and fast SSD and hard drive destroyer which renders a wide range of storage devices unusable. Simple and safe to operate, destruction of media is guaranteed. The Crunch 250 provides a perfect accompaniment to a degausser providing the best way to destroy a hard drive whilst also being an ideal solution for companies who recycle used media storage devices. The Crunch 250 hard disk crusher is fitted with our unique Data Destruction Auditor which enables the user to document and verify HDD and SSD destruction and create data protection audit-ready reports which can be used as evidence of the destruction process. Find out more about the Data Destruction Auditor here. With its enhanced features, the Crunch 250 is the most effective media and hard drive destroyer on the market. Unlike other degaussers that erase data through powerful magnetic fields, the Crunch 250 hard drive crusher destroys the drives and memory chips. 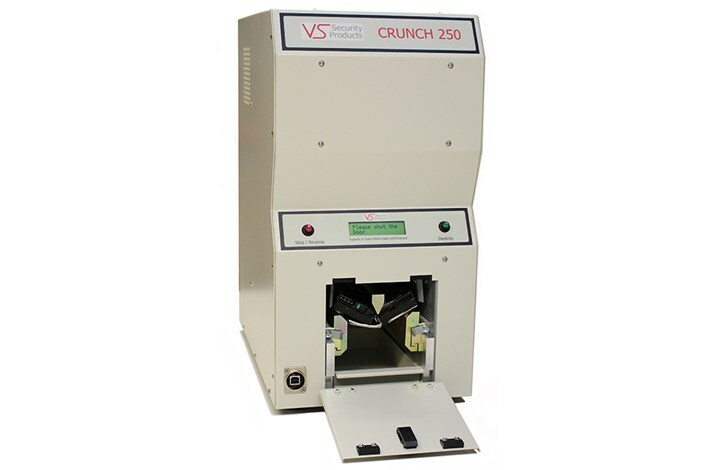 For companies that require the utmost security, the Crunch 250 provides a perfect accompaniment to a degausser. It is also beneficial for companies who recycle used media storage devices. The unique Log System records all operating and destruction information which can be saved and printed, giving hard copy evidence of complete data destruction. Neat and compact, the Crunch 250 HDD crusher can destroy media in just 9 seconds and is, therefore, time efficient and office friendly. It is easy to use and has inbuilt safety features. Additionally, the handy LCD display shows the progress of the data destruction.